Based on actual events, this is the epic story of Abilene, Kansas, at a time when the cowboy was king, might made right, and the future seemed as unsettled as the endless prairie. Abilene, 1871. Will Merritt is fiercely protective of the cattle trade that made his father’s fortune. Idolizing the cowboys who flood the streets each summer, Will and his friends are drawn to Abilene’s exotic Texastown district—a powderkeg of saloons and brothels so notorious that the mayor has hired the West’s most famous gunman, Wild Bill Hickok, to police its streets. Yet even with Hickok as marshal, Abilene boils with deep divisions. The townsfolk resent the migrant settlers whose new farms are slicing up the rangeland. And no one is more intolerant than Will’s best friend, Jasper, who delights in tormenting any farmer he encounters. But Will finds himself torn when he meets the beautiful and beguiling Anna, whose dignity and determination test his deepest beliefs. 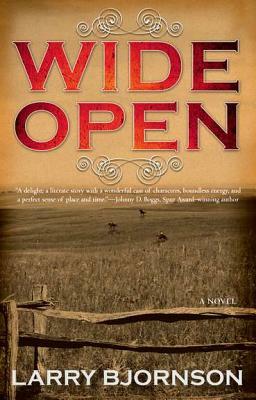 Then Will’s father reveals a stunning secret that challenges Abilene’s future, one that makes the Merritts outcasts. And when Wild Bill’s tenure as marshal comes to a violent head, Will realizes that everything—his family, his friends, and the only home he’s ever known—could be gone in an instant, leaving only an empty wilderness once again. A long term resident of Southern California, Larry Bjornson graduated from the University of California with degrees in history, political science, and public administration. His family owns and operates a North Dakota farm originally purchased 70 years ago by his grandfather (who once played a violin piece for Buffalo Bill Cody). Currently, he does marketing for a yacht dealer in Newport Beach, but storytelling has always been his true love. Larry won both the Spur Award and the Forward National Award for his fiction.